If there’s anything else you need to know please don’t hesitate in getting in touch! We love the outdoors and we want you to enjoy it too! Breese Adventures was born out of a love for the outdoors and the mountains. We understand the barriers that can get in the way which prevent you getting out there and want to help you do something you never thought you could. However big or small your adventure might be we are here to provide friendly personalised support so you can achieve your goals and go home with memories, achievements and even some new friends. Yes you do! Our events are made up of groups of likeminded people, usually 6-12 of them and because our events are graded they will all have around the same experience and ability as you. Some of our events are even specially tailored, for example: singles, over 50’s, women only. Our qualified and experienced guides will be with you throughout your adventure. We do! We have a range of events which will hopefully provide you with some inspiration. 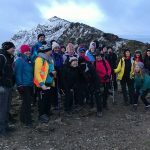 If there is an adventure or a challenge you have always wanted to do or a hill or mountain you’ve always wanted to try but you can’t find it here have a look at our ‘Your Adventure’ section. That’s what we’re here for! Once you have registered for your event we will sent out all the information you need including training advice and a kit list. It is important to us that you have all the advice and support you need running up to your adventure and we are always at the end of an email or a phone to answer any questions. With a mixture of experience, frustration, age denial and skills developed over the years between us we will make sure, whichever event you chose it will be YOUR challenge and YOUR adventure. If you are unsure of your dirriculty levels, please see our breakdown below. If you have any queries then please do not hesitate to contact us. No experience necessary but you must be able to complete a 2 hour walk as minimum to participate in a leisurely / beginners walk. Some walking experience is necessary in mountainous terrain such as Snowdonia or the Lake District. A reasonable level of fitness is required and you must be in good health. You must have experience of long walking days in mountainous regions such as Snowdonia or the Lake District. A good level of fitness is important and you may need to undertake some training before attempting a challenging grade walk. You need to be confident of your physical condition. You should have experience of very long walking days in mountainous regions such as Snowdonia or the Lake District. A high level of physical and mental fitness is required and stamina is essential, as walking days are long. You need to have complete confidence in your own abilities before undertaking a tough grade walk. On completing your form you can select the option to pay by debit card through our payment processor Stripe. This is the only way we can take card payments. Please use your surname and date of the event as reference. Cheques should be made payable to Breese Adventures. You will need to contact t us for the postal address. Please put the name and date of your event on the back of your cheque. Once we have received your booking you will get an automated ‘Booking Pending’ email. if you have not paid through Stripe we will hold your place for 7 days until we receive your deposit. Please read our terms and conditions before making a payment. One day event – £25 per person (if your event is less than 4 weeks away please send us the total event fee as shown on the event page). Weekend / multi day event – £50 per person (if your event is less than 8 weeks away please send us the total event fee as shown on the event page). Are dogs allowed on the event? We currently have a no dogs policy on all of our events. We are reviewing this for some of our larger day time events and will update asap. Most of our events are over 18’s only, however for some events children age 14 and over can attend providing they are accompanied by a responsible adult. One child per adult.